Yeah, my biggest concern at the moment is the price tag. I fully expect it to run into the billions of euros, and I'm not sure there's room in the budget for it. I hope so, but we'll see. Even if the stone edifice was saved, though, it might have been structurally compromised to the point where it would have to be torn down and reconstructed. The towers were saved, which is great news, but the transept, the apses, the altar and nave may have to be totally replaced. It will cost tens of billions of Euros, but I think people everywhere could raise that money. It's such a cultural icon that people would want to contribute to its rebirth. "Well-funded" is the key term there; just raw materials is going to be a beast. Full roof is 21 hectares (or ~13,000 trees) worth of oak, with the long beams requiring 300-400 year old trees. Not sure that's been an option in Europe since the Napoleonic Wars. Hell, outside of architectural salvage I don't think I've ever seen oak beams longer than 24' in the US, much less that 40' sort of range it sounds like some of them are. 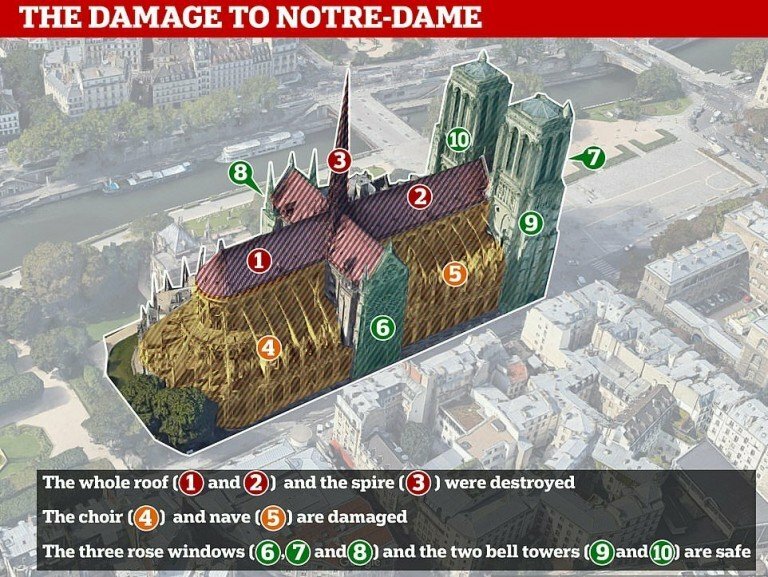 I really hope they throw enough money at this to repair it properly though; after 800 years as a symbol of France it just seems worth doing right. It will cost tens of billions of Euros, but I think people everywhere could raise that money. It's such a cultural icon that people would want to contribute to its rebirth. Agreed. I've never been to Paris, but I'd throw money at it regardless. World cultural heritage is important, and I'd like to see it stay around for the future. "Well-funded" is the key term there; just raw materials is going to be a beast. Full roof is 21 hectares (or ~13,000 trees) worth of oak, with the long beams requiring 300-400 year old trees. I find it highly unlikely they'll be rebuilding the interior roofing section with flammable contruction materials. Not after this. With the heritage of the beams literally up in smoke, very little point of risking the same disaster just for authenticity. But I agree. It'll be all about the money. Macron has apparently already commited to an international fundraising campaign launching tomorrow. I will definitely throw a small contribution at it. One of the best vacations of my life was your typical London>Paris>Rome>&Home sightseeing trip. Looks like only a small swath of the vault collapsed when the spire fell. Everything in the main interior seems to be okay. I to would throw in a contribution, monuments like this are what make Humanity what it is. Apparently they've already managed to raise 450m€ from some billionaire and a bunch of companies so that's a good start! Still salty about Rainbow Warrior ? Yes, Pinault offered 100M for reconstruction and then Arnault of LVMH naturally had to one-up him with 200M this morning. If you're particularly purist, the damage is irreparable. If you take that there are peak values in the arts, then renovators cannot possibly come close, because then there was an ecosystem to build these cathedrals and generations of carefully transmitted iterations of perfection for each part of labor involved; whereas today no matter how talented the renovator and convenient his tools, he simply does not have the same level of taste, contextual awareness, or sheer devotion of time and apprenticeship [especially in today's transparently profiteering economy... they overbuilt things back then for lack of engineering knowledge] to get close to the original intention. That being said, there is some hope yet in replication... we have a pretty thorough laser-scan of the Notre Dame somewhere in the academic archives, by a Vassar historian who passed away last November.